the whole horse newsletter, Issue #001 -- can you tell if your horse is happy? It isn't as obvious as you would think to tell how a horse is feeling about his surroundings and his work. Young horses especially are susceptible to withdrawing into themselves when they feel threatened and this may appear like calmness. The better a sense of your horse's personality you can become aware of, the better you will understand his reactions. If he or she doesn't seem to have much of a personality, this is a warning sign and probably means they are withdrawing, either from the current situation or in general in their lives. It is sadly very common for horses to withdraw after a traumatic experience, and simply stay in that state of mind, and body for years. At some point in their lives they may begin to exhibit 'difficult' behavior, quite often at the age of 6 or 7. This may begin to happen because they are older and more confident in their environment, and they feel ready to express their lack of trust in their relationship with people. It can also be because they reach a critical point in their ability to compensate for how they feel i.e. a kind of equine nervous breakdown. 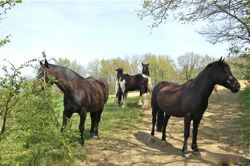 Common reasons that young horses may withdraw in their relationships with people are abrupt and insensitive weaning, sudden stressful interventions like branding and injections, rushing the backing process, shoeing or stressful transportation. If the first ever contact a young horse has with people is some kind of a struggle, it will be traumatic for the horse even if in principle it is not harmful, for example leading or putting on a rug. Of course it is preferable to gain a young horse's trust at the beginning and maintain it throughout all these experiences. The world isn't perfect though and often this ideal is beyond our control. It is, however, absolutely possible to bring a horse back into a state of confidence and acceptance as long as you are capable of reacting in the right way for long enough. You have to decide at the outset, though, that the horse comes first, and come hell or high water you won't give up on him. Horses are a lot more perceptive than we often imagine, and they know if you are going to give up on them or not, and to convince them you must be 100% certain in your own mind. We took on a little Spanish horse who was about to be put-down because he was unrideable and unmanageable. Thing's had gone wrong with him early on in his relationships with people because he was a rig*. By the time he was bought by his previous owners, he had lost his trust in people almost entirely, and they did not have the experience or unfortunately the willingness to help him. He arrived in the summer and we figured out his hormonal status pretty quickly! A blood test confirmed that his testosterone levels were close to that of a stallion. 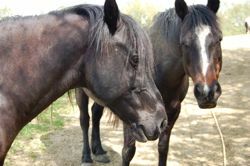 He was happy with an older brood mare and her two youngsters, and the contact with them settled him down a lot, but his relations with people were still nonexistent. Going anywhere near him in the field caused him to charge away in a mixture of terror and anger. The autumn came and the weather was turning and we were starting to rug the horses up. By this time he was accepting the head collar and human touch, but in a fairly erratic way, and if anything upset the delicate routine, he reverted to his fearful response. One evening I went to put on his rug, and a car drew up in the car park, near his field. He saw this and decided I wasn't getting near him. This was my opportunity however to show him that I wasn't giving up on him, and I followed him around that field for at least an hour and a half. Eventually he stopped and let me put the rug on. This scenario was repeated about 3 or 4 times and each time he was a bit more convinced that there was nothing to be frightened of and he was truly cared about. He knew perfectly well that his rug kept him warm, or in the morning he needed it off to be comfortable. Only a year or so later he would allow anyone to approach him and catch him or deal with his rug etc. Now three years later he will come to anyone who calls him and he loves people. Of course it wasn't only these experiences with the rugs that resolved his issues with people, but they went a long way to restoring his trust. *A rig is a male horse with one retained testicle and only one removed in the normal gelding operation. Also known as a cryptorchid, rigs have high testosterone levels, so usually have a stallion's behavioral characteristics, but are infertile. Just as it is essential to become highly aware of our own body, and how our personal perception relates to reality, it is also essential to be able to feel the state of your horse's mind when you are riding. We believe that you do this by developing a sophisticated awareness of his body. This awareness begins even before you let your weight down into the saddle and continues until after you dismount. 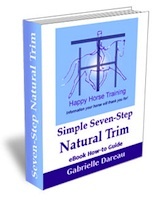 You train yourself to become a sponge which can absorb every nuance of tension in the horse's body, allowing you to respond to an approaching state of tiredness or pain before it is too late. When it is too late you have already weakened the hard earned relationship based on trust between the two of you. You will find that as you develop your technical abilities as a rider, i.e. your postural strength, your awareness of your own straightness and the correct use of your posture to apply the aids, this opens the door to the development of your intuitive abilities and therefore sophisticates your perception to a very high degree. 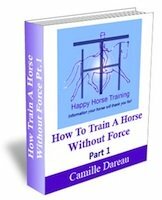 It is possible (eventually) to become aware of physical injuries, emotional states, and even birth patterns in your horse, while you are riding. Imagine how this could change your connection with your horse!